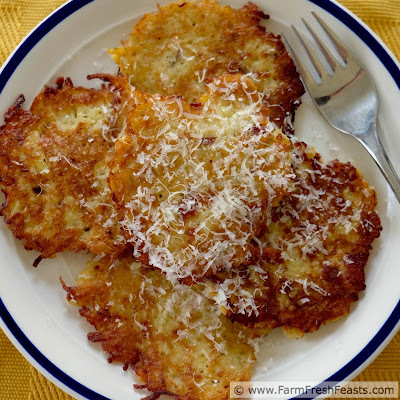 Shredded turnips flavored with freshly grated parmesan cheese and crispy bacon, bound up in these savory fritters, make an excellent dinner side dish or brunch entree. Folks, I've got to level with you. Turnips are something I used to endure about a farm share. 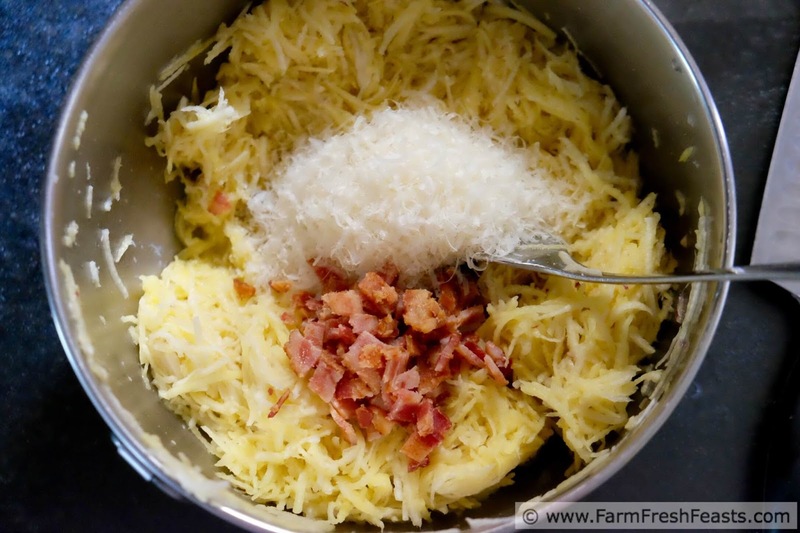 I've found that some oil and some cheese make them actually quite delightful, and if you throw bacon into that mix my family gets on board, too. It's funny how eating seasonally from a Community Supported Agriculture (CSA) farm share broadens your palate. Over the years I've gone from tolerating beet greens to friskily anticipating my first Sautéed Beet Greens with fried egg brunch plate. I've gone from scratching my head at garlic scapes to popping cubes of garlic scape pesto into all sorts of savory dishes like Shrimp and Garlic Scape Scampi. Turnips have remained a stubborn nut for me to crack, so to speak. I've had plenty of failures (never made it to the blog, occasionally featured on my FB page) trying to find ways to love these frequently-appearing beasts. I may never crave them, but I'm pretty comfortable with getting turnips in the box now. I've got plenty of options in my toolkit (shared on my Turnip Recipes Collection) and am willing to try new things. My latest, not ready for blog time recipe, is using farm share turnips in a homemade Branston Pickle spread. My son loves it, and it's a meatless sandwich spread for him while he works to lower his bad cholesterol and boost his good cholesterol. In the meantime, however, I've got a fritter for you. 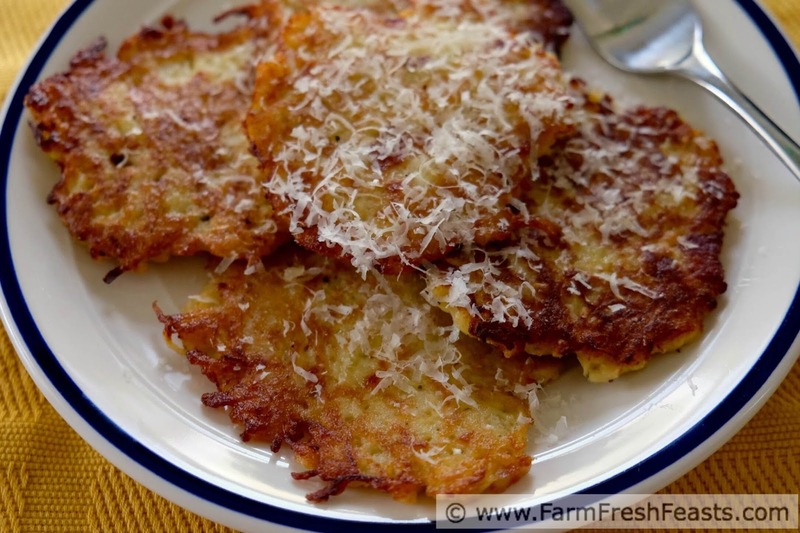 I took my plain jane Turnip Fritters and a hunk of parmesan cheese I picked up at my local grocery store and dressed them up in a savory combination with bacon. Because, bacon. A little bacon goes a long way--I bake mine and freeze it and end up using just a few slices in most of my dishes--but the flavor comes through. When you're looking for a simple brunch or lunch meal, or a side dish to a more complicated dinner, consider these Bacon and Parmesan Turnip Fritters. They are a delicious way to eat your locally grown veggies! 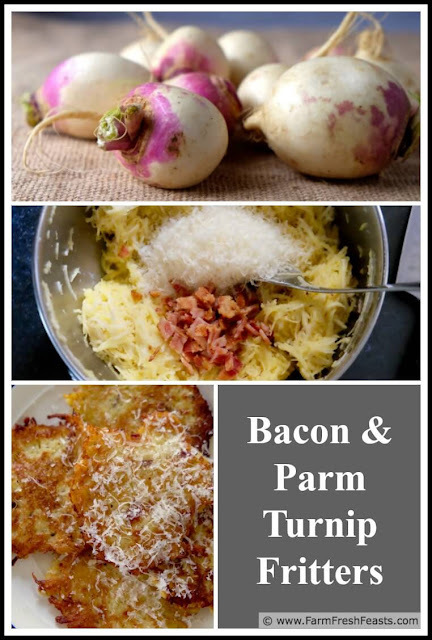 For more recipes using turnips, please see my Turnip Recipes Collection. It's part of the Visual Recipe Index by Ingredient, a resource for folks like me eating seasonally from the farm share, the farmer's market, and amazing grocery store sales. I'm pinning recipes that spark my joy on Pinterest, follow me there. I'm sharing articles that catch my eye on Facebook, follow me there. I'm sharing what's happening in my day on Instagram, follow me there--especially if Basset hounds make you smile. Want to know How to Use This Blog? In a large bowl, combine turnip, egg, salt and pepper until thoroughly mixed. Dump crumbled bacon on top, and grate some parmesan into the bowl too. Stir to combine. Dump dry ingredients on top, and stir to combine (I use a fork). Set aside. Preheat a large skillet over medium high heat, and add about a Tablespoon of oil. When it is shimmery, drop about ¼ cup of batter (I use a large forkful) into the skillet and spread out. When the bottom is lightly browned, flip over and continue cooking the other side. It takes me about 5-8 minutes total to cook each fritter. Transfer to a warm oven to keep the fritters hot until they are all cooked, or just leave them on a plate until all the batter is used. Add another Tablespoon of oil to the skillet as needed. 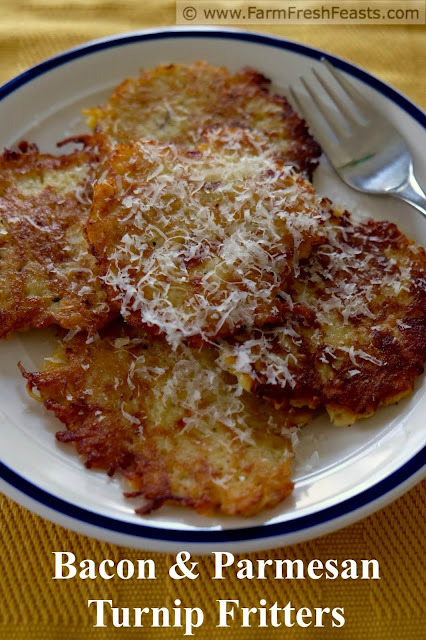 Serve warm or at room temperature, topped with additional parmesan cheese and butter or yogurt. 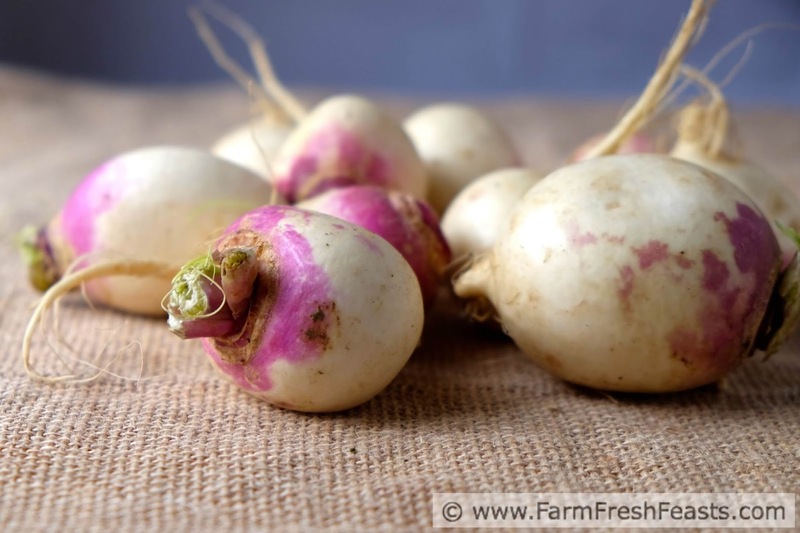 I would absolutely try these if we get a batch of turnips this year. I never know what to do with them and yes, bacon and cheese make everything better. If you get a batch of turnips. If! I love the uncertainty. It's a known quantity around here!